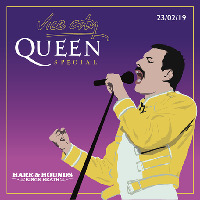 Vice City return for a Queen special club night on Feb 23rd. Is this the real life? Is this just fantasy?.. This one's for real Birmingham! We know what you want to hear and we leave no stone unturned, that’s a guarantee. Don't stop yourselves now... Get those requests posted on the wall, get on your bicycles and we'll see you Killer Queens Saturday 23rd Feb.